Under GST, the forms for procedural compliance is notified to make sure that the formats are uniform. So that communication between GST officer and the taxpayer is effective. Form GST CMP- 05 is the format in which a Show Cause Notice is to be issued by a GST officer to a Composition Dealer. A Show Cause Notice is issued by a GST Officer when they want the dealer to explain why they should be allowed to avail the benefits of Composition Scheme. The dealer opted for composition scheme when not eligible. The dealer has broken the rules of the scheme. The GST officer having jurisdiction over the dealer should issue the notice. Since, the composition scheme is a canopy covering all the GSTINs having same PAN number, any notice issued with respect to one GSTIN shall be applicable to all the GSTINs registered under the same PAN. Similarly, any order issued to a business with a GSTIN shall automatically apply to other GSTINs registered with same PAN. 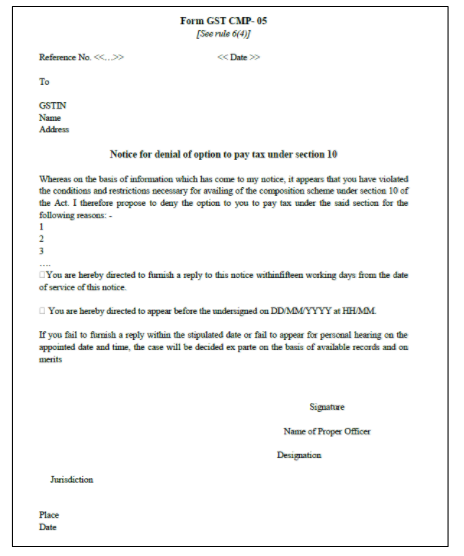 The notice must mention the reasons for which the composition scheme is denied to the taxpayer. The reply to the notice has to be provided by the taxpayer in GST CMP-06. The officer may also direct the taxpayer to appear before him on a designated date. 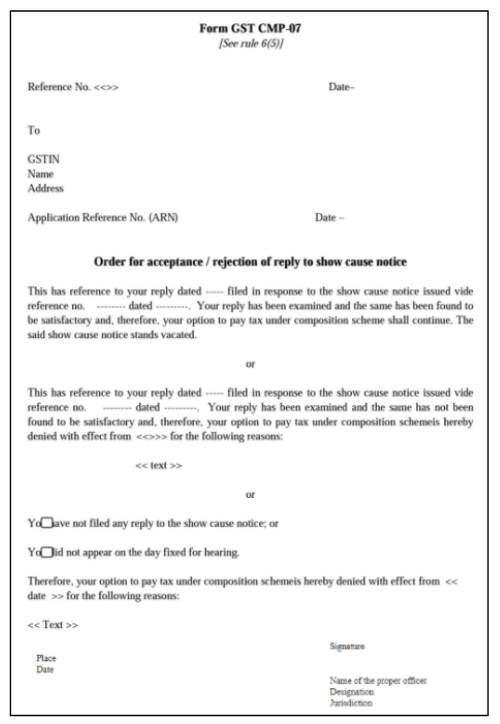 GST CMP- 06 is a reply to the notice received in CMP-05. (CMP- 05) to the GST officer on the GST Portal. followed should be mentioned in the form. The time limit to submit the reply is within fifteen days from the date of receipt of notice in CMP- 05. Reply containing detailed explanation justifying that the dealer can avail composition scheme. List of documents enclosed as PDF with the form. Where the reply exceeds 500 words, the reply has to be uploaded separately. At last, the taxpayer has to sign the verification confirming that the details declared are true and correct. 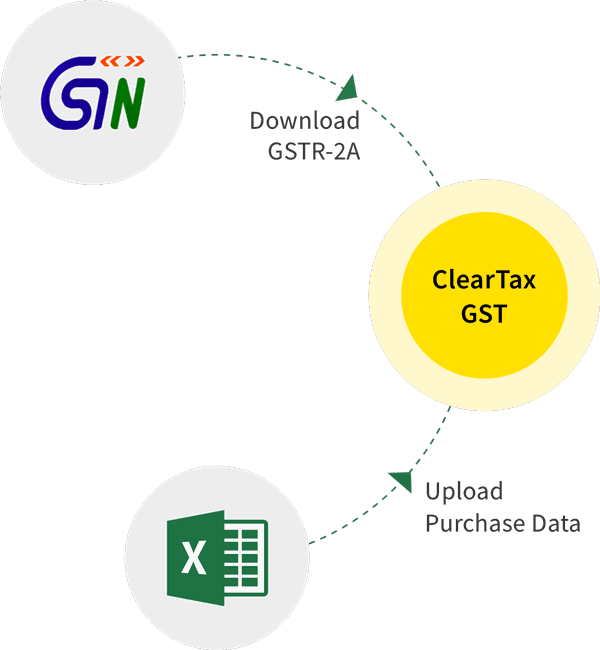 On receiving CMP-06, the GST Officer has to issue an Order to the dealer in GST CMP-07. received in CMP-06 by GST officer. giving them a chance of explaining in person. If the officer finds the reply satisfactory, he may accept the reply by issuing this order allowing the taxpayer to continue under composition scheme. If the officer does not get any reply, he can issue CMP-07 and stop the taxpayer from continuing to be a Composition Dealer. The officer should issue the order within thirty days of receiving CMP-06. 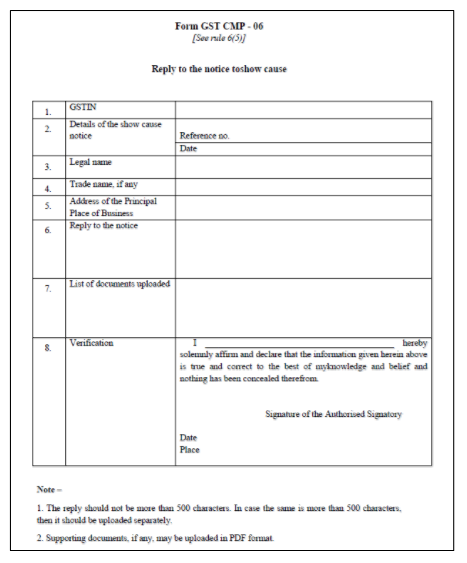 When the reply is not received, the order should be issued within thirty days from the date of expiry of the time limit of fifteen days from the date of issue of show cause notice. What should be done when the GST officer passes an order to withdraw composition scheme? CMP-07, declaring the details of Input Tax Credit.